Anyway... I used some October Afternoon Ducks in a Row paper to create the patchwork on the front of the card, then I did some zig zag stitching between the squares. I colored with Copics and used Prismacolor pencils on the ears, cheeks, and ground line. I gave the basket a woven appearance by drawing lines with my Copic Colorless Blender. I finished the inside of the card as well. The kids will be home from school soon, then I'm planning to spend some time outside! I hope you're having a great day -- thanks so much for stopping by! Happy Monday, everyone! I hope you had a great weekend! Ours was very good. Of course, we watched plenty of NCAA basketball (heartbreaking losses for both XU and UK!). Megan was in a school performance of Godspell yesterday, and it was a great way to prepare for Easter! Anyway, on to my card! 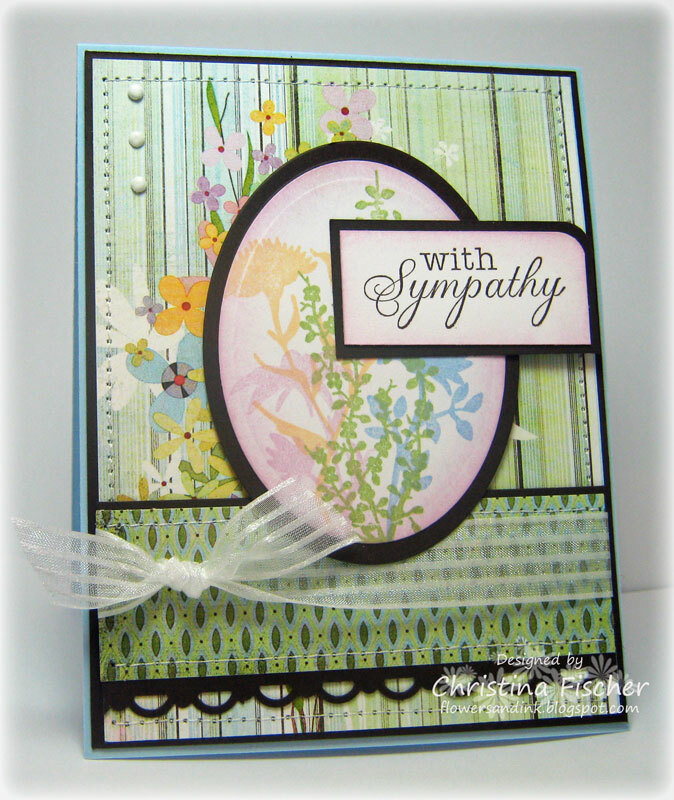 I needed to make a sympathy card, and I had wanted to keep it Clean and Simple. Well, it took on a life of its own, and it wasn't so simple in the end. I ended up with layers, sewing, sponging, and embellishments -- I just couldn't help myself! Stamps: Silhouette Blooms I (Cornish Heritage Farms) Ink: Bashful Blue, Certainly Celery, Apricot Appeal, Pale Plum, Chocolate Chip (SU!) Cardstock: Bashful Blue, Whisper White (SU! 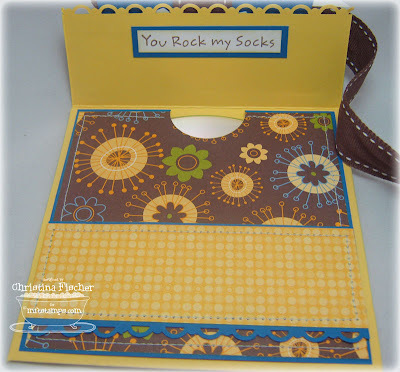 ), Hot Fudge (MFT) Paper: Kioshi 6x6 pad (BasicGrey) Other: Oval Nestabilities (Spellbinders), corner rounder, border punch, sponge, dimensionals (SU! 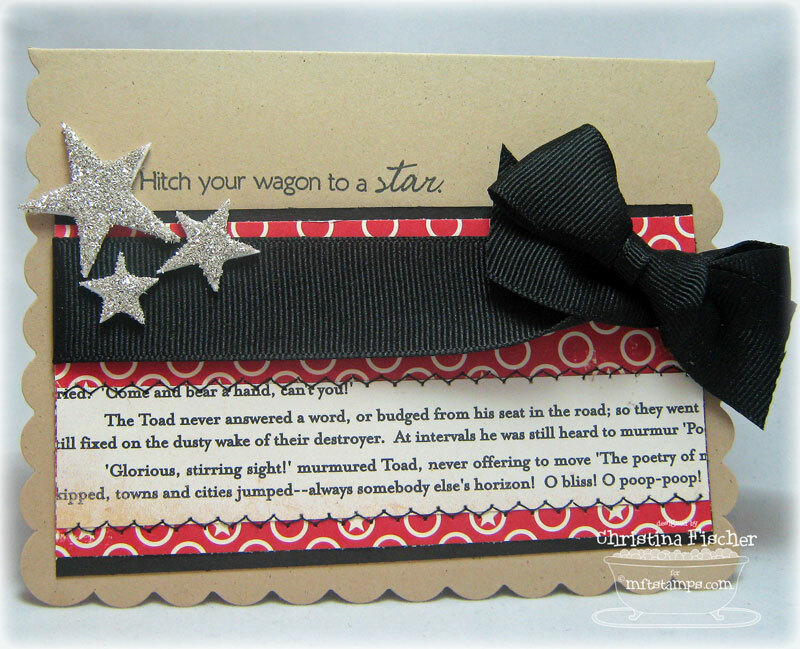 ), ribbon, braddies (MFT), sewing machine Card Size: 5.50" x 4.25"
Hi there! It's been way too long since I've posted a Sunday Supper, I know! I found this recipe in my recipe box and realized I hadn't made it in a while. It's an easy crock pot soup, perfect for these busy days! Mix all ingredients together. Cook in crock pot on high for 4 hours. Serve with shredded cheese, sour cream, and tortilla chips. Hello! Happy Thursday! 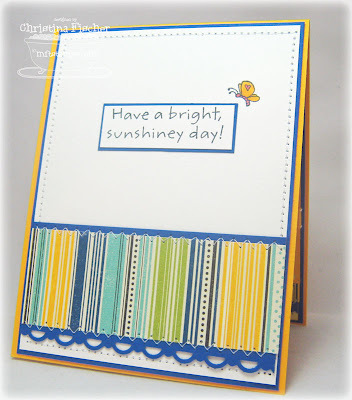 Yesterday Kim posted this week's challenge for the MFT Wednesday Stamp Club (WSC). It's all about using Glitzy Glitter! You might remember the Glitzy Gear I made a few weeks ago; I was happy for a reason to get out the glitter again! This time I created a clean and simple card, drawing inspiration from the sentiment (part of the MFT set Clearly Sentimental about Emerson). I had a pack of foam stars (purchased for next to nothing at Michaels), and I applied silver Glitzy Glitter to three of them. 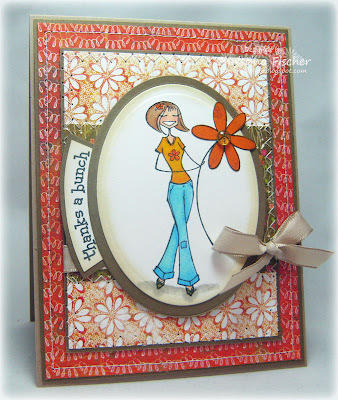 What a quick and easy way to jazz up those embellishments! I hope you have a chance to play along with Kim's glitzy challenge! I'd love to see your creations! Thanks so much for the visit today -- have a fantastic day! Hi there! 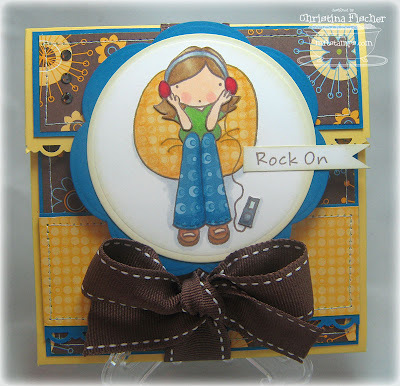 Have you seen this month's Project Parade over at Verve Stamps? You can find the details on THIS post on the Verve Blog. The theme this month is Fun with Flowers, and I wanted to play along! I chose this image and sentiment from Beautiful You. I really thought this winter would last forever, and I've never been so glad to see spring arrive! I hope you're not tired of seeing this Beloved paper, because I still have a little bit left! ;) I used Cuttlebug dies to make the paper flowers. I inked all the edges and did lots of machine stitching. The half pearls and ribbon are from SU!. This card will be going to Susan and Eric Liles. Eric has just been diagnosed with cancer -- you can read about it on Susan's blog HERE. I know they'd appreciate everyone's prayers and good wishes. Thanks so much for stopping by on this spring day. I hope you're having a good one! Happy Saturday! We've had some gorgeous spring weather here -- sunny, blue skies, and temps near 70 degrees! My mind has been wandering outside during the day, but I did get a chance to make this card last night. I saw on Blogabella that the Bellarific Friday challenge for next week is a sketch, so I got an early jump on it! I guess I had spring flowers on my mind, because I paired Daisybella with my new BasicGrey Green at Heart paper (I *love* this paper!). I paper pieced the flower and added a MFT Glittered Garnish to the center. I was able to curve the sentiment before attaching it to the acrylic block, and I cut a curved mat for it. I finished the card with some SU! ribbon and machine stitching. Well, we have two birthday parties and a soccer game today -- I'm planning to get out and enjoy this beautiful weather! I hope you have something great in the works for your day, too! Thanks so much for stopping by! That's all for today -- one more day 'til the weekend! The days are just a blur lately! I hope you're having a great one -- thanks for stopping by! 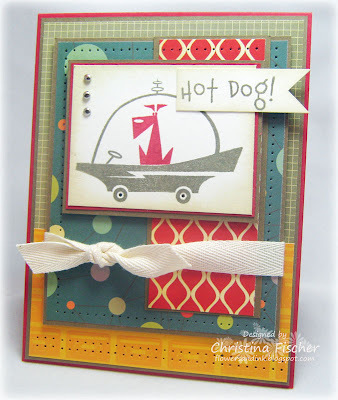 Stamps: It's a Mod, Mod World (TCP) Ink: True Thyme, Riding Hood Red (SU! 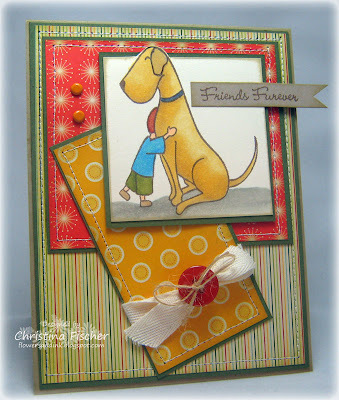 retired), Vintage Touch Chai (PTI) Cardstock: Riding Hood Red, True Thyme (SU! retired), Whip Cream (MFT) Paper: The Boyfriend Mini Deck (Cosmo Cricket) Other: paper piercing tool, twill, MFT Braddies, dimensionals Card Size: 5.50" x 4.25"
Oh my goodness -- could this set be any cuter? I think not! I only wish I looked this chic when I was pregnant! :) I paper pieced her top and the bags, and I colored the rest with Copics. The ribbon and buttons are available at My Favorite Things. Here's a closeup of the image and sentiment. I used a Prismacolor pencil to add some shading to her top. Happy Saturday, everyone! 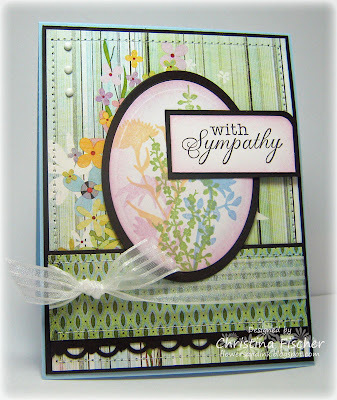 Today's card is one I made for a sad occasion. My sister-in-law's family just had to euthanize their dog, as he had been suffering from cancer. I wanted to let them know we're thinking of them. This set, MFT's Friends Furever, immediately came to mind. I altered the ear on the dog by omitting the ones on the image when I was inking it, then drawing in the new ear. Now it looks more like their beloved Lab, Alby. The sketch is Mojo Monday 129. It's different, but it was fun to work with! The paper is from Cosmo Cricket's Garden Variety Mini Deck. I inked all the edges and machine stitched around all the panels. I hope this card brings them smiles and good memories. Alby will defininely be missed! Thanks so much for the visit today -- I hope you're having a great weekend! 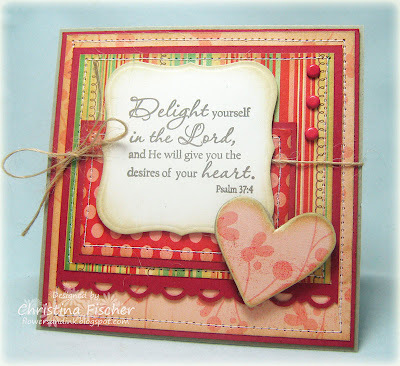 Stamps: Psalm 37:4 Plain Jane (Verve Stamps) Ink: Memento Rich Cocoa (Tsukineko), Vintage Touch Chai (PTI) Cardstock: Kraft, Ruby Red, Very Vanilla (SU!) Paper: Be Loved (My Mind's Eye) Other: Labels One Nestabilities, chipboard heart, twine, brads, border punch, dimensionals, sewing machine Card Size: 4.25" x 4.25"
Hi there! Happy Wednesday! Thanks so much for hanging in there with me during my little "break"! My mojo was lacking, and there were things I needed to take care of at home, but I think things are returning to normal! 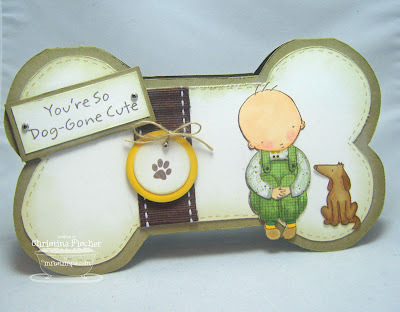 The image is Boy & Dog - Dog Gone Cute, and the template is Kathy Daume's Dog Bone template. I distressed and inked the edges of the cardstock, and I used a Creamy Caramel marker to create some faux stitching. 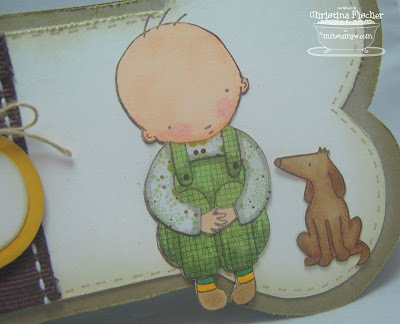 The boy's clothes are paper pieced with Origins 6x6 paper. I used Copics and Prismacolor pencils to color the images and to add shading to the paper piecing. Hi, everyone! Happy Saturday! I'm feeling a little mojo-less these last few days. Last week was a whirlwind of samples, blog hops, and releases, and it's left me lacking in the creative department. Does that ever happen to you -- please tell me yes!?! Anyway, this weekend my husband and son are in Chicago having some much-needed "bonding time," and I'm home with my girls. I'm enjoying watching movies, reading, and just chillin' with my little ones. I'm sure this down time will restart my mojo, and I'll be back soon with something stampy to share! Thanks so much for stopping by today -- have a wonderful weekend! It's Time to Shop and Hop! Hi there! It's time to Shop and Hop with My Favorite Things! All the new releases are available right HERE, right now! :) If you arrived here from Michele's Blog, welcome! If not, you'll want to go back to Kim's Blog and start from there so you don't miss a thing! 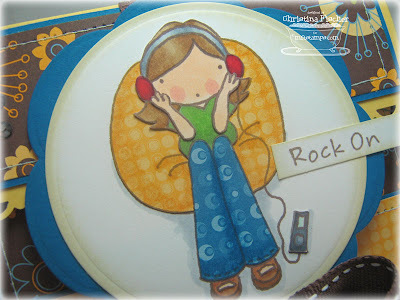 I'm thrilled to be sharing Tweeny Teen - Rock On with you! Think of her as the big sis' of those adorable Pure Innocence cuties! I have teenagers, so I can definitely relate to this set! I found in my stash some retired papers that looked teenager-y to me, and I created this CD holder. My kids are always making CDs for the car or to give to friends. I thought this would be a fun way for my daughter to give a CD to a friend! I paper pieced the image in several layers, and I also pieced the iPod. I used Prismacolor pencils to add some subtle depth and dimension to the chair and to her pants. The rest of the image was colored with Copics, and I sponged around the image circle. When the bow is untied, the CD is revealed inside. I added another sentiment inside the flap! Thanks so much for hopping by! Have a great night! Happy Wednesday! I'm back with my last MFTeaser before tonight's release! Today we're previewing the sets Who's That Birthday Girl?, Invitation Only, and Clearly Sentimental about Birthdays. I used two of the sets on this card. 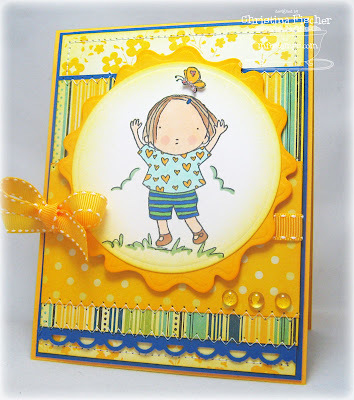 The layout is the sketch for this week's Wednesday Stamp Club. 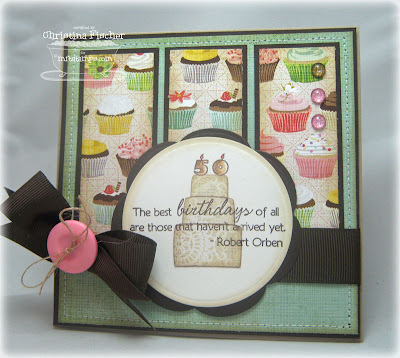 I used some of my Nook and Pantry 6x6 paper, and I paper pieced the birthday cake from Who's That Birthday Girl?. I stamped the candles on top and colored them with Prismacolor pencils. I stamped the sentiment from Clearly Sentimental about Birthdays directly over the cake. The Glittered Garnishes and ribbon are from MFT. Be sure to stop by Kim's Blog after 11 am for the links to all of today's MFTeasers! Tonight is the Release Party! Get all the deets HERE! Join us for fun from 8-10 pm, then get ready to Shop and Hop when the sets go live at 10:00! That's all for now! I'll see you back here tonight for the Hop! Thanks so much for visiting! CC Designs Spring Sugarplums Blog Hop! Hi there! 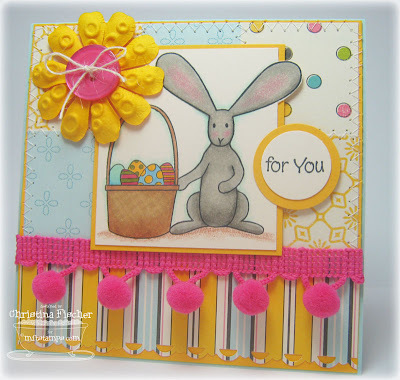 Welcome to the CC Designs Spring Sugarplums Blog Hop! There are so many images in the Spring Sugarplums release, so the DT is doing a Hop to show you all the fantastic ways you can use them! If you just happened upon my post, be sure to start at the beginning by going to Ria's Blog! You can also find a master list of all the participating DT members by going to the ATS Blog. I chose this sweet Trevor image for my card. 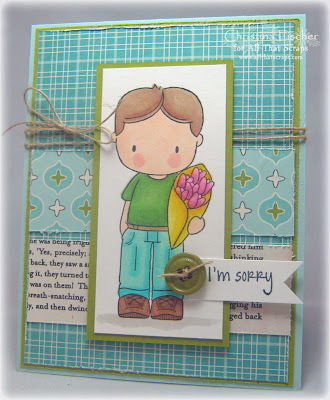 He reminds me of my son when he was little -- how I wish he'd bring me flowers now! I kept the design simple and boyish, with some distressing, twine, and a button. The paper is by October Afternoon. 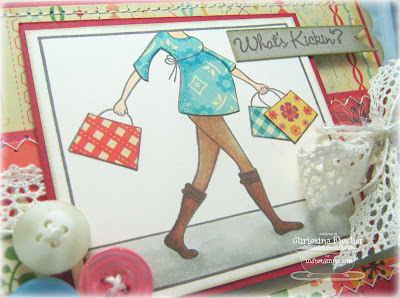 I'm your last stop on the Blog Hop -- I hope you like all the samples you've seen! These adorable Sugarplums and all the new March stamps will be available tomorrow (Wednesday) at 10:00 pm at All That Scraps! Hi there! I'm back with my second post of the day! This time, I have MFTeasers! All of today's previews are of Tweeny Teen, Boy & His Dog, and Pure Innocence. 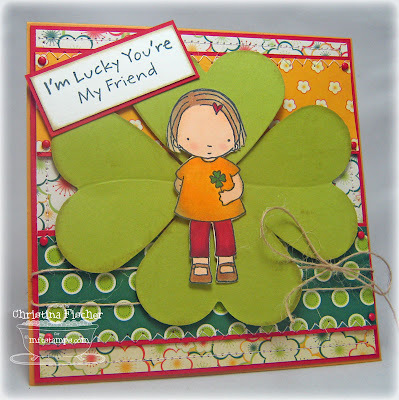 I have a couple PI cuties to share with you: Sunshiney Day and 4 Leaf Clover. 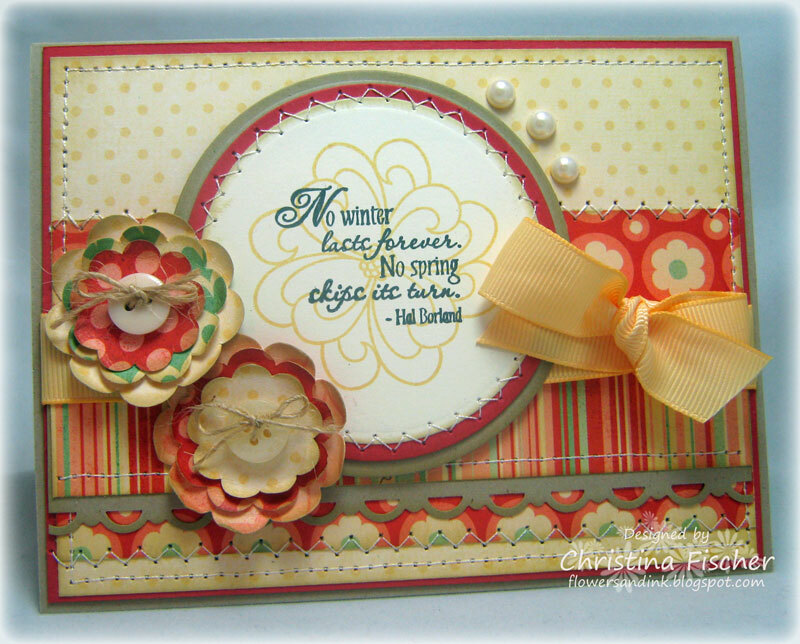 For the Sunshiney Day card, I used October Afternoon Hometown paper and one of the Peony Nestabilities to create a sunny card. I inked the edges of the paper and cardstock with Summer Sun ink, and I popped up the little butterfly. The yellow Glittered Garnishes are also from MFT. I finished the inside of the card, and I stamped just the butterfly above the corner of the sentiment. On the 4 Leaf Clover card, I used a heart punch to create the leaves of this large 4 leaf clover. I scored the centers and inked the edges, then I placed the PI image on dimensionals in the center. The paper is Garden Variety by Cosmo Cricket. 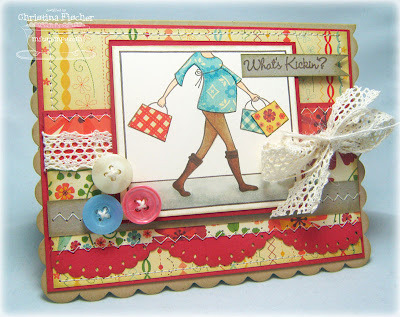 Stop by Kim's Blog after 11 am to see the list of designers who have teasers today! Don't forget the release Wednesday night at 10:00 pm! Also, there's still some time to enter the MFT March Guest Designer Contest -- you can find all the details HERE! The previews continue tomorrow -- I hope you'll be back! Happy Monday! It's a busy day -- this is my first of two previews today! I'll be back with my MFTeaser a little bit later, but now I have an adorable new Swiss Pixie to share with you! 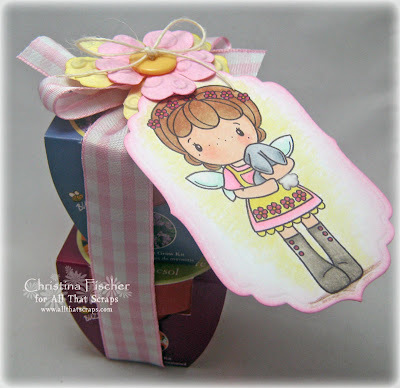 This is one of two CC Designs Easter Swiss Pixies, and I used her to make this tag. I colored with Copics, then I created the glow and ground line with Prismacolor pencils. I sponged around the edges with SU! Pretty in Pink ink, and I applied some white Fun Flock to the bunny's tail. I'll be back with my second post in a bit -- thanks for stopping by!